IKA offers the ideal overhead stirrer for your stirring and mixing tasks in the lab - for lower to high viscosities. IKA overhead stirrers effortlessly process stirring quantities of up to 200 liters. 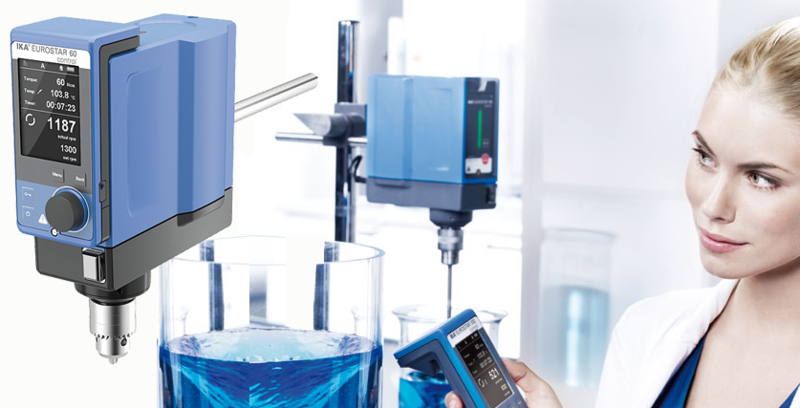 IKA lab stirrers and overhead stirrers stand out due to their indispensable features, including an electronic safety circuit, a digital display, two speed ranges, and a controlling option via the lab software Labworldsoft. A broad spectrum of stirring tools is the key to successful mixing. Functionality, safety, and longevity are the main goals in the development of IKA's overheard stirrers. IKA Eurostar 20 Digital Overhead Stirrer, Maximum Stirring Capacity 15 liter (H2O), Stirring Speed from 0/30-2000rpm. Newly designed overhead stirrer from IKA Works. IKA Eurostar 40 Digital Overhead Stirrer, Maximum Stirring Capacity 25 liter (H2O), Stirring Speed from 0/30-2000rpm. Newly designed overhead stirrer from IKA Works. IKA Eurostar 60 Digital Overhead Stirrer, Maximum Stirring Capacity 40 liter (H2O), Stirring Speed from 0/30-2000rpm. Newly designed overhead stirrer from IKA Works. IKA Eurostar 60 Control Overhead Stirrer is the most enhanced overhead stirrer in the laboratory market. Large TFT display, wireless control. IKA Eurostar 100 Digital Overhead Stirrer, Maximum Stirring Capacity 100 liter (H2O), Stirring Speed from 0/30-1300rpm. Newly designed overhead stirrer from IKA Works. IKA Eurostar 100 Control Overhead Stirrer is the most enhanced overhead stirrer in the laboratory market for high capacity stirring tasks. Large TFT display, wireless control. IKA Eurostar 200 Digital Overhead Stirrer, Maximum Stirring Capacity 100 liter (H2O), Stirring Speed from 0/30-2000rpm. Newly designed overhead stirrer from IKA Works. IKA Eurostar 20 High Speed Digital Overhead Stirrer. 20 Liter (H2O)s stirring capacity at 0/150-6000 rpm high speed. Powerful overhead stirrer for stirring tasks where high speed mixing is a must. The IKA Eurostar 200 Control P4 overhead stirrer is one of the most advanced and powerful overhead stirrers that is specifically designed for large amount of high viscous material stirring applications.